I have been hoping for some of the nocturnal creatures to make an appearance. And they did! We had a porcupine walk past and eat some of the marula fruit at the gate. 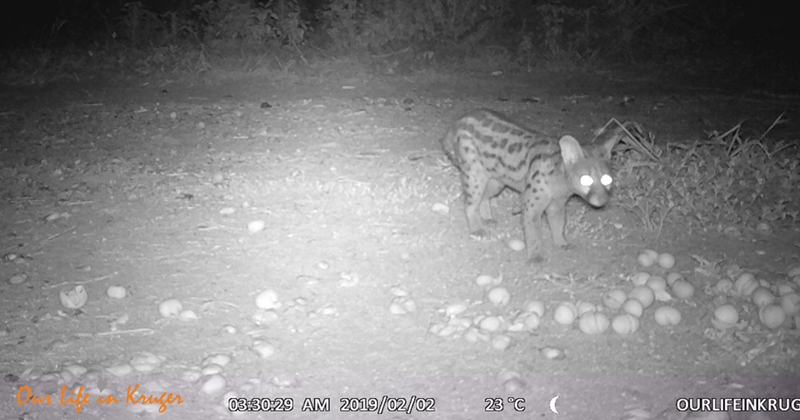 And then some lovely footage of a Large-spotted Genet too! But my absolute favorite is the elephants eating the marula fruit. You can see so clearly how amazing an elephant’s trunk actually is: dexterous and muscular, able to pick up fruit after fruit with their two ‘lips’. The low position of the camera makes it very interesting to watch. The sounds are just delightful! Porcupine. Such a lekker find on the trailcam! I have compiled a video again with some of the Trailcam footage. Have a look. The last bit of footage features impalas and monkeys alarm calling. I am sure there was a leopard or a hyena around. Also: I have started a YouTube Channel to keep all of Our Life in Kruger’s videos in one place. There aren’t many videos there yet, but I will continue to add as I make them. If you enjoy our ‘Tales of the Trailcam’ blog series, if you would like to see more footage from other cammers or if you have a camera trap of your own and you want to share your footage, I would like to invite you to join a new group on Facebook. It is called ‘Trailcamming in Southern Africa’. In this lovely group, other trailcammers share their photos and videos from all over Southern Africa. Check it out! And please do not forget to answer the two questions when you join! Our camera will travel to work with Steven again tomorrow. I am curious what Tales it will tell when he gets home! Wonderful captures on your trailcam Linda. I agree; the elephant trunks are absolutely delightful to watch as they delicately feel for the treats so far below them. It must be a very warming experience to know that there are all those night visitors wandering past your house as though they are part of the family! Such a good idea to start a YouTube channel too. Hi Sal! Only have a chance to catch up on all the comments now. I loved the nighttime creatures too. It feels like the park almost has two different worlds. The one we see during the day and then a whole different one at night after we go to sleep. The Trailcam gives us a bit of a peek into that other world. Love it! Elephants are amazing creatures. Love the footage you are getting from your camera. Looking forward to your net post on Thursday. Your posts help keep the longing for the Park at bay. Thanks, Denise! Glad you enjoy our stories! Love the trail cam, could watch for hours. I think you will have to get a second one so you and Steven can each have one. Great idea to have a you tube site for all the videos. A good way to see a few at a time……. binge watch. I think that is a great idea! Starting to save up for a second one!! I denk erover om een camera bij ons in de bush te plaatsen, kun jij me een merk aanbevelen? Dat zou leuk zijn! Mmm het ligt een beetje aan je budget. #Bushnell heeft in mijn opinie geweldige camera’s. Mooi beeld, snel reactie vermogen. Maar daar hangt wel een prijskaartje aan. Mijn camera komt bij de Aldi vandaan.Een Maginon Wildcamera. Doet het voor nu prima, maar als ik eerlijk ben als het ooit binnen onze financiele mogelijkheden komt, zou ik zelf ook zeker nog een Bushnell aanschaffen. Thank you Linda. I love the video from your trailcam, especially the Elephants eating the Marula fruit from the ground. I am amazed at how many they pick up at one time and do not appear to drop a single Marula when putting them in that big mouth ! Keep up your good work. Thank you, Mavis! Those trunks hoovering up the fruit is one of my favorite Trailcam finds! Wow, wow at the Spotted Genet and the Porcupine. I need that Ellie to help vacuuming. He has it down to a fine art. Those nocturnal animals were such a lekker find on the trailcam! I am reminded of someone with a big hand picking up golf balls with one hand. One has to wonder if it is done by smell alone or if they also have the ability to peer down that long NOSE to help with what appears to be and extremely fine motor skill. You mention hoovering up in the context of the animal. Years ago someone had a home competition to name their new great dane – the friend who won would get a bottle of (very rare in Rhodesia) Scotch whisky. They had a braai and after watching the GD snuffling up everything that fell on the ground someone won the scotch for naming HOOVER!! hahaha, Erik! Hoover sounds like a fantastic name for a great Dane!! I would think that the elephant’s sense of smell helps them a lot. Those ripe marulas smell divine!! Dank je, ik ga me er verder in verdiepen!